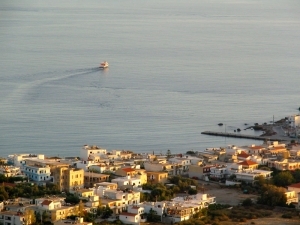 Paleochora is located in the province of Selino, 75 kilometers from Chania on the southwest of the island Crete. A very small peninsula proudly called the «Bride of the Libyan Sea» by the villagers. According to reports, Paleochora was built on the ruins of ancient Kalamidis. In 1280 the Venetian Duke of Crete, Marino Gradenigo first built the «Castelo Selino» on a height with magnificent view of the Libyan sea, today known as «Fortezza» . From this point you can enjoy the magnificent view of the town and a breathtaking sunset at the end of the day. Paleochora, which has a population of approximately 2500 inhabitants, has developed into a popular tourist center offering visitors all they need. There are beautiful beaches with crystal clear waters, archaeological sights and amazing landscapes, not forgetting the picturesque streets of Paleochora. A large number of studios and apartments are available for rent at very reasonable prices. All amenities are available, banks, post office, super markets, bus station, telecommunications office, health centre, private doctors, dentists, paediatricians, drug stores, police station, and coast guard. At whichever point of the village you find your self in, you will be able to walk to a beach. 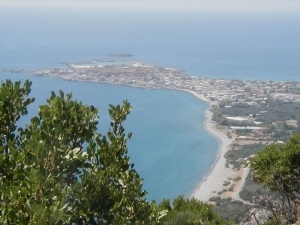 To the west there is the famous sandy beach «Pachia Ammos» and to the east the beautiful «Halikia» beach. Apart from these beaches which you can reach on foot from the centre of Paleochora, you can also visit beaches with your own transportation. Beaches like Gianiskari, and along the road which leads to Koundoura you can also find the popular beaches, Psilos Volakas, Karavopetra, Plakaki, Grammeno and Krios. Close by there areas of exceptional natural beauty and environmental value which you can visit, such as the Gorge of Samaria, the Gorge of Agia Irini, and the small Gorge of Anydri-Gianiskari. Other beautiful areas are, the Island of Gavdos, the beach at Elafonisi, the district of Koundoura, and picturesque villages inland like Voutas, Anydri and Azogyres. You can also see archaeological sights on the way to Paleochora like the ancient Byzantine churches of Kantanos and Plemeniana, villages like Asfentiles, Prodromi and Spaniakos. Also very interesting is the Monastery of Chrysoskalitissa near Elafonisi and the archeological sites of Lissos and Kadros. Daily ferries connect Paleochora with Sougia, Agia Roumeli, Hora Sfakion, Elafonisi and there are regular ferry trips to Gavdos. In the evening roads of Paleochora are closed to the vehicles, to provide people with a place to walk, buy, eat and enjoy the exceptional night life of the town. Paleochora is a place that you will never forget. Enjoy the sun, the sea, the great Cretan food and the warm hospitality of the people. From Chania (central bus station) to Paleochora: 3 to 4 times daily, journey time: about 2 hours. From Heraklion to Paleochora: with a change in Chania. From Heraklion to Chania every 30 to 60 minutes daily, journey time: less than 3 hours. From Chania airport to the central bus station of Chania, journey time: 15 minutes. From Chania airport to Paleochora, journey time: about 90 minutes. From Heraklion airport to Paleochora, journey time: 3 hours. from the airport. Please contact us in advance, or the taxidriver Tel. No. +302823041128, e-mail: spiros-taxi@mailbox.gr orpaleochora-taxi@yahoo.gr . This may be a cheaper option, although costs are unpredictable, depending on fuel costs. Daily ferries connect Paleochora with Sougia, Agia Roumeli and Hora Sfakion. There is also a ferry from Paleochora to the island of Gavdos.